There are many ways in which we can try and alleviate our stress levels when we come home at the end of the day. Many of us prefer to soak in a hot bath with a glass of wine or relax in front of the television. Likewise there are a considerable number of us who like to embark on a long walk perhaps along a nearby beach or go to bed with a book. For a great many people however, one of the best ways for them to relax is to listen to music. Music is often used to invoke certain feelings and emotions in the movies or in television programmes and the same can be said of our own lives. There are so many different types of music available to us now that listing them all would take a long time indeed. Many of the categories of music that we might have been once familiar with have now branched off into other directions with variations on certain musical themes. Ambient music is often built around swirling chord structures, string sections and the inclusion of perhaps sounds that we would not associate with being particularly musical such as the rain, wind or thunder storms. This music can also incorporate underlying melodies or percussive rhythms that in some cases mimic the beating of the human heart and encourage the listener to concentrate on their own heartbeat. Ambient music is excellent if you are relaxed and want to stay that way before eventually dropping off to sleep. Easy listening is a category of music that has – over the years – taken on many different forms. It can incorporate anything from jazz to acoustic performances, piano pieces and softly sung ballads. Easy listening is categorised as music that can be listened to without invoking feelings of anything other than feeling mellow. It could best be described as a form of wistful melancholy. Easy listening is excellent if you are trying to wind down on your arrival home from work, or indeed on the journey home from work. Classical music has for a long time been one of the types of music best associated with relaxation and a feeling of calm. Based around orchestral strings, wistful wind instruments and delicate melodies, many of the classical pieces we have come to know and love have been used as a means of bringing about a gentle all over relaxation. There are some of us find opera hard to listen to but for many it is relaxing and thought-provoking. Usually operas and their music have a story to tell and these stories themselves can bring about a feeling of calm and peace while we listen to them. Some of these operas – which are normally broken down into acts – begin with a strong stirring sound indicating perhaps the dissolution of a relationship. This is followed by Act two which moves on through stirring arias against swirling accompaniment before finally Act three brings about the rejoicing for a love rekindled or a new love found. When you finish work today and make your way home how will you feel? Will be stressed and disconcerted by the day’s events or will you be happy that you have completed another good day at the office? Whatever your mood there will be types of music that will best suit it. For some who have travelled home angry and frustrated music with a heavy drum sound, strong electric guitars and bellowing vocals will do the trick. For others ambling instrumentals will mirror their mood of reflective contemplation. And whatever your mood there will be a style of music to coincide with it and it is important to make the right choice as opposed to simply putting on the first CD you come to; take time to make your choice and take time to decide how you are going to listen to your selection.Will you listen to it using headphones or will you listen to it whilst soaking in a hot bath? 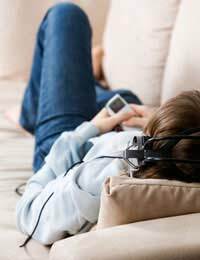 In whatever manner you wish to listen to your music, it is a culmination of your surroundings, your mood and your choice of music that will make relaxation time something to savour.